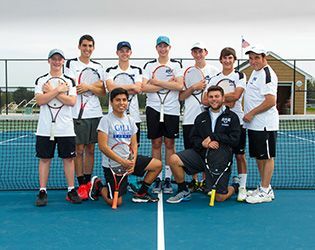 Boys’ tennis finished with an impressive 10-4 record this season, competing in the NJSIAA Non-Public B South Sectional Quarterfinals, garnering a second-place finish in the Prep B Championships and finishing as runner-up in the Skyland Conference Mountain Division. The team began April with a pair of 5-0 wins, defeating Bernard’s High on April 5 and North Hunterdon on April 6. In both matchups, team captain Billy Conlan '16 won in straight sets at first singles, while George Harris '16 won in straight sets at second singles. After a 3-2 loss to Rutgers Prep on April 8, the team recorded another pair of 5-0 wins, dominating Franklin High and Warren Hills Regional High. The remainder of April brought another loss against Rutgers Prep and wins over Somerville High, Bernard’s High, North Hunterdon and Warren Hills. The Knights started off May with a 5-0 win over Franklin High. Wining in straight sets were Conlan (first singles), Harris (second singles), Marc Orazietti '16 (third singles), Seth Gelwarg '19 / Michael Urowky '16 (first doubles) and Will Henderlong '16 / Will Orazietti '18 (second doubles). The team closed out the month with a mix of wins and losses. At the Prep B tournament finals on May 26, the Knights tied rival Rutgers Prep for second place. Individual highlights from the day included Marc Orazietti claiming the title at third singles. Looking ahead to next season, rising junior Will Orazietti, who played second doubles, will be a vital part of the 2016-17 squad. In addition, the team will hope to acquire some talented newcomers, as six members of the eight-man roster graduated this spring. Among them were Conlan at first singles, Marc Orazietti at second singles, Harris at third singles, Urowsky at first doubles, Nicholas Ross at second doubles and utility player Brian Quispe.